The images were all too familiar, bringing memories of the jihadi raid of PNS Mehran a few years ago. Only this time it was not a military base that was the target of the terrorist attacks, but a civilian airport. 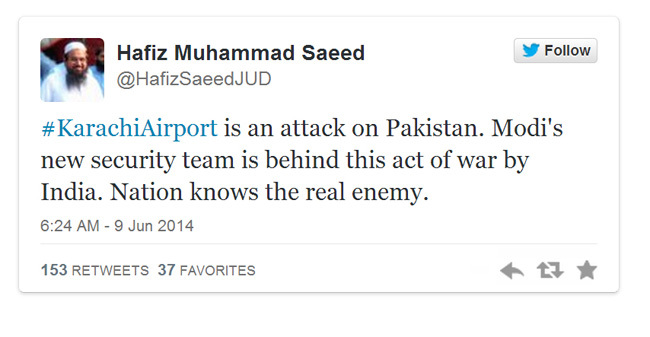 And not just any civilian airport, Jinnah International Airport. The symbolism of the target was not lost. Chaudhry Nisar said ‘the attackers appeared to be foreign nationals while the weapons they used also hinted towards a certain country’. The Interior Minister did not name the country he believes was behind the attack, leaving that vital detail to the imagination, or at least to the imagination of Hafiz Saeed. Actually, Director General of Sindh Rangers Maj-Gen Rizwan also gave evidence that foreign militants were involved in the attack, but it was not Modi’s team, it was Taliban’s. The attack started late Sunday when gunmen disguised as police guards stormed the terminal after opening fire with machine guns and a rocket launcher. 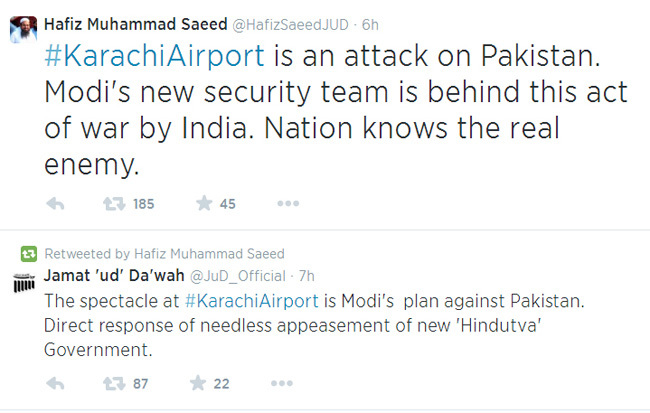 Hafiz Saeed wasn’t the only one using the attack as a pretext for pushing his own political agenda. Imran Khan too couldn’t resist the opportunity to launch his own political attack. Khi airport terrorist attack shocking. Continuing security & intel lapses reflect a failure of the govt’s National Counter Terrorism Policy. Kaptaan’s narrative is remarkably similar to the one being desperately promoted claiming that Sindh Government was warned about possible attacks against ‘sensitive installations in Karachi’, but this too seems to be a quickly invented excuse. After all, why lay the blame on the all mighty security forces if a provincial government can take the blame? The question remains in the minds of many, however, if agencies had gathered intelligence about the attack, why did they do nothing to stop it? If intelligence agencies can’t stop terrorist attacks, what purpose do they serve? Once again, we saw one of our ‘sensitive installations’ burning at the hands of jihadis. PNS Mehran, Bannu Jail, Serai Naurang Army Post, Osama bin Laden living outside PMA Kakul…another intelligence failure that raises fundamental questions about the priorities of our security agencies. And once again the nation is divided against itself. The only unifying characteristic of the reactions is that they are excuses created to avoid the necessary conclusions – and ultimately providing space for Taliban to continue their rain of terror. This entry was posted in Blogs and tagged agencies, Hafiz Saeed, imran khan, karachi airport, terrorism by Mukhtar Ahmed. Bookmark the permalink.